Introducing Kybella, the first non-surgical way to treat the double chin. The area under the chin can hold excess fat – the dreaded double chin – for a variety of reasons. Whether it’s due to genetics, increased weight or simple aging, fat under the chin can be hard to get rid of and a frustration for many. Refined Skin Medi-Spa is proud to announce a revolutionary solution to melting the double chin – without surgery. Submental fullness is the medical term for that stubborn double chin fat. For years, liposuction or surgery were the only options to eliminate the double chin. However, patients wishing to melt chin fat without surgery can now do so with Kybella. Kybella is an injectable treatment to reduce the double chin. 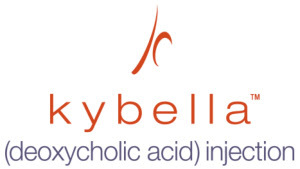 Kybella contains a naturally-occurring ingredient called deoxycholic acid, something your body already produces. This ingredient destroys fat cells. Afterwards, those cells can no longer store or accumulate fat. How quickly can I see results with Kybella? Patients should plan on about six treatments spaced one month apart, with approximately 12-20 injections per visit. Each treatment will be about 15-20 minutes in length. Many patients have seen reduced chin fat in two to four treatments. These results may last for several years and re-treatment is often not necessary. Does Kybella firm loose skin? Kybella is intended to melt fat under the chin and not to tighten loose skin, though some patients in clinical trials have reported tighter skin under the chin. Kybella has been approved by the FDA and is considered safe. However, the most commonly-reported adverse reactions in clinical trials were: swelling at the injection site, bruising, pain, numbness, reddening of the skin, and areas of firmness. If accidentally injected into the skin, there is a risk of nerve injury in the jaw area or damage to skin cells. Since Kybella is an injectable, a local anaesthetic is used before each treatment. Who should get Kybella treatments? Anyone wishing to reduce their double chin without surgery or liposuction is an ideal candidate for non-surgical Kybella. Kybella has been FDA-approved to treat areas of fat under the chin and has not yet been used for other fatty areas such as undereye bags. If you have had prior surgical or aesthetic treatment in the area under the chin, caution is recommended when pursuing the Kybella treatment.